Literally Wizards is a game publisher located in Indianapolis. Our first game, Buy the Rights, was published in early 2017 and is now on its second printing. With Gen Con over I thought I would post a quick update with some Buy the Rights news. We sold out of the first print run and were able to self-fund the second printing recently, and just received the games right before Gen Con. With our second printing, Buy the Rights is a lot more profitable and we are looking forward to expanding into retail a lot more. Which brings me to the second news item. Buy the Rights will soon be available in multiple Powell's Books locations in Portland, Oregon! Powell's is an awesome indie bookstore chain and has one of the largest bookstores in the world, and we're super excited to be featured in their stores. We'll talk about things we've learned since our first printing and more in an upcoming episode of the podcast, so stay tuned. 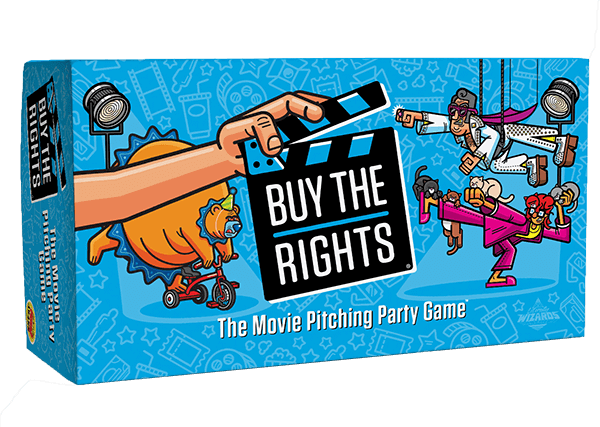 The Literally Wizards team is excited to be showcasing Buy the Rights at a couple events this summer. If you'll be attending either of these events, come by and see us. You can play Buy the Rights with us, buy a copy, and check out some other swag we'll have available. We'll be showing off Buy the Rights at Pop Con this year, a great event focused on movies, TV, gaming, and more. We should have the booth number soon. Buy the Rights will be making its Gen Con debut this summer in Entrepreneur's Avenue. We'll be set up at booth number 3056 and will have plenty of copies of the game and the 80s Action Expansion, as well as extra goodies like stickers, pins, and more.